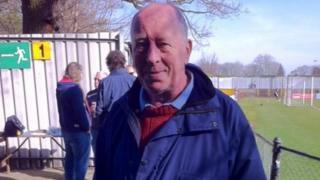 A football club is to name a terrace in honour of a volunteer who died after falling from a roof at its ground. Clive Churchhouse, 71, died in hospital following the fall at Clarence Park, the home of St Albans City FC, ahead of a match with Luton Town in July. The club said it will rename the York Road terrace The Clive Churchhouse Terrace. A commemorative board on the terrace will be unveiled by ex-Arsenal and England striker Alan Smith on Saturday. Club secretary Tom Norman said Mr Churchhouse was a "big part of the club". "He had been coming here for 50 or 60 years, he was a volunteer who worked tirelessly for the club and was close to the players, management and board," he said. "We thought it was only fair to remember him in this way." St Albans' home game against Gloucester City on Saturday will be dedicated to Mr Churchhouse and the club will hold a minute of applause in his honour prior to kick-off. The Health and Safety Executive (HSE) is investigating the circumstances surrounding the death. A spokesperson said: "We are currently reviewing the material collected by Hertfordshire Police, who initially attended the incident, and St Albans Council. "Our thoughts are with the man's family, we have already contacted them to explain HSE's role and the current status of the investigation." A date for an inquest has yet to be confirmed.